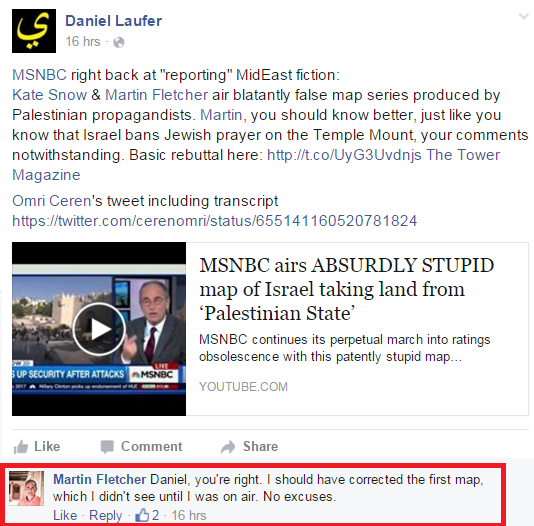 MSNBC’s Martin Fletcher sort-of partially apologized for the outrageous use of The Map That Lies on the air on Friday. But his comment indicates that he is far from a Middle East expert and really doesn’t get what he did – his own words on the air were almost as bad as the map itself. The outrage was far more than the first map. The second map is deceptive as the plan wasn’t implemented because of Arab hate; the third map calls land that was controlled by Egypt and Jordan “Palestinian” even though no one called it that before 1967; the fourth map doesn’t note that it would look almost exactly like the third had they accepted Israeli peace plans. Moreover, your comments that Israeli settlements are continuously expanding and taking up more and more territory are highly misleading; Israel has approved only a handful of new settlements since Oslo (in response to court rulings) and the amount of actual land the settlements are on has barely budged although far more people live in them. So no, no excuses for the entire segment and both you and MSNBC must apologize, as well as investigate how notorious anti-Israel propaganda ended up on the air to begin with. The last point is important; MSNBC staffers grabbed The Map That Lies from an anti-Israel site, edited it to adhere to MSNBC style standards and used it as if it had a shred of legitimacy.